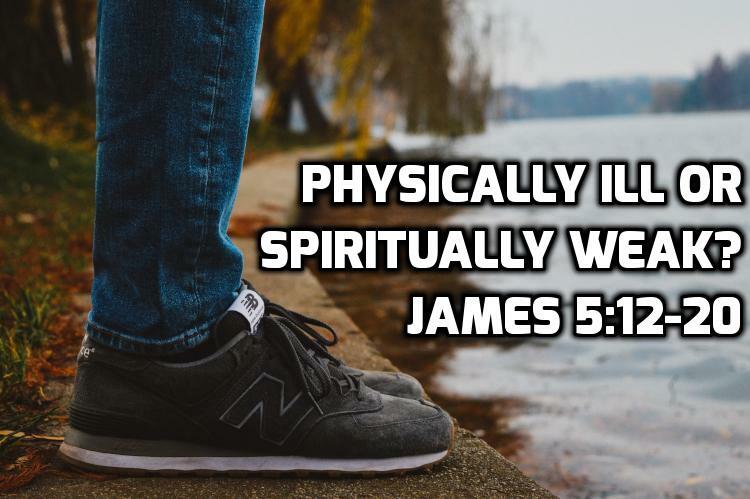 You are here: Home / Passages / James / 12 James 5:12-20 – Physically ill or spiritually weak? We reach the end of the letter of James today. Due to time constraints, I gave you my summary of the main themes and principles last week. Chapter 5 – James turns to wealth and gives three pieces of evidence of that they may be trusting in their wealth: 1) hoarding (5:2-3); 2) fraud (5:4) and 3) self-indulgence (5:5). Finally in the immediate context to today’s verses, he calls for them to wait patiently through trials and to face trials with the settled conviction that there is a purpose for the trial. The way you understand this passage turns on the way you understand the word “sick” 5:14. The Greek word (Strong’s G770) is used 37 times in the New Testament. Basically it means weakness, but its field of meaning includes one of the most common manifestations of weakness which is being physically ill. The word’s meaning is NOT confined to physical illness NOR is it confined to spiritual illness, that is weakness with respect to faith. Luk 4:40 While the sun was setting, all those who had any who were sick with various diseases brought them to Him; and laying His hands on each one of them, He was healing them. 2Co 13:3 since you are seeking for proof of the Christ who speaks in me, and who is not weak toward you, but mighty in you. Are we praying for one who is physically ill or one who is weak and weary? I land on the “spiritually weak” side. James 5 by itself is — apart from the larger context — is truly ambiguous. It is perfectly reasonable to think it is referring to sickness, especially if you look at the passage in isolation or if you think James is a loosely organized collection of proverbs. Ultimately which option we choose rests on our understanding of the larger context. I think taken in the larger context, it makes much more sense to see it as spiritually weak.